At the meeting, President Widodo spoke highly of Vietnam’s careful preparations for the WEF ASEAN 2018, which served as a foundation for the success of the event. He added that it is an important event, offering huge opportunities for the development and application of creative industries and digital technology. 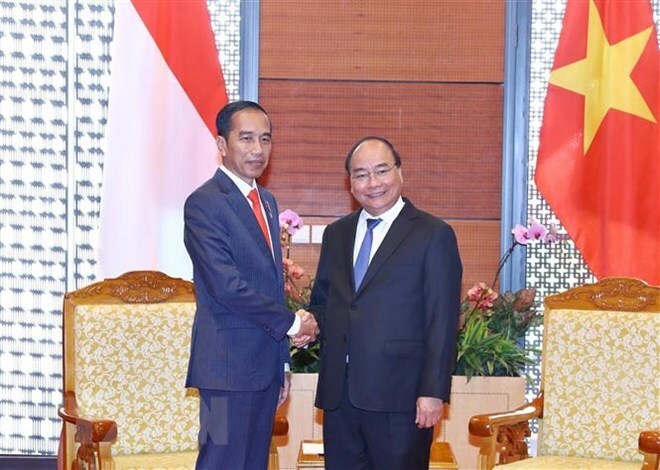 The two leaders expressed their delight at the positive development of the Vietnam-Indonesia strategic partnership in the five years since its establishment. They also lauded the signing of an action programme on the implementation of the strategic partnership for the 2019-2023 period, towards celebrating the 10th anniversary of the establishment of the strategic partnership in 2023. Both leaders affirmed their determination to fully tap the two nations’ potential in economic cooperation in order to bring bilateral trade to 10 billion USD in 2020 and towards an equal trade balance. President Widodo welcomed Vietnam’s export of agro-forestry-fishery products, steel, and electronic products to Indonesia. The two leaders also agreed to devise a suitable mechanism to promptly handle troubles and suggestions from businesses of both sides, creating favourable conditions for bilateral investment. 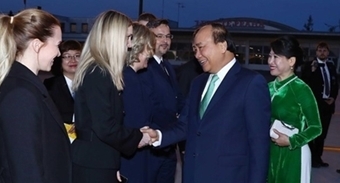 PM Phuc and President Widodo consented to accelerate negotiations on the demarcation of the exclusive economic zones between the two countries in line with international law, especially the 1982 United Nations Convention on the Law of the Sea (1982 UNCLOS). The two sides promised to cooperate closely to limit illegal fishing and affirmed that the issue of arrested fishermen and fishing vessels should be handled in a humanitarian spirit and in accordance with the two countries’ friendship and international law. On this occasion, President Widodo said Indonesia will return 155 Vietnamese fishermen who are currently being detained in the country. The two leaders agreed to increase consultations on regional and international issues, coordinate to build a united, self-reliant ASEAN, and enhance ASEAN’s central role in the regional architecture. They reiterated their consistent stance on the East Sea issue; ensuring peace, stability, security, safety and freedom of navigation and aviation; settlement of disputes through peaceful measures and in line with international law, particularly the 1982 UNCLOS; full and effective implementation of the Declaration on the Conduct of Parties in the East Sea, and acceleration of negotiations on a practical and effective Code of Conduct in the East Sea (COC).